Discover the amazing benefits of journaling. Learn about mental health from a common sense and compassionate point of view. Book a workshop for your group. ​A powerful day of writing and discovering the deep stuff. "It gave me time and an atmosphere to look at my thoughts more deeply, very non-threatening." "Time spent focusing on myself, which I don't do much of...motivation to start journaling again." "I have a lot to consider and putting ideas on paper makes it easier." it's for everyone! Can't wait until the next one! Our biggest group yet! Vineyard Church in Kenner, Louisiana extended a warm welcome to this journaling workshop and they are ready for Part 2! Thirty-two women put pen to paper, laughed, cried, reflected, and shared their experience of writing in new and varied ways. It was a pleasure to spend the day with them. In May of this year, I had the pleasure of giving my clinical workshop to a group of professionals at East Baton Rouge Parish Library Main Campus. It is always fulfilling to be able to pass on to other professionals the benefits of this work by giving them the first hand experience of writing in a very accepting and welcoming format. It's designed to help us overcome our own self-censorship. It's fair to experience that freedom ourselves so we can in turn offer the experience to others. We had a variety of clinicians attend from hospice, schools, addiction treatment centers, child welfare agencies, mental health clinics, etc. And each walked away with a new tool or insight they could apply to their personal or professional lives. Many thanks to the National Association of Social Workers - Louisiana Chapter and East Baton Rouge Parish Library Main Campus for hosting! I learned "how much I need to journal! I learned about things I needed to deal with that I didn't know existed." "Doing the exercises helped me acknowledge feelings I needed to address. I will use this with my clients. I know it will be beneficial." I liked best..."actually doing the techniques - one should never recommend a tool they haven't tested." "I gained personal insight and I am motivated from my own feedback to take some specific actions." ".....I can combine my love of writing with my social work." An engaging group from the New Orleans and Baton Rouge areas. This year we welcomed our first guests from the Mississippi Region. The word is spreading....many thanks to the North Shore Pastoral Center for hosting. "I learned that I could find and obtain peace through writing." "I liked the self-discovery, learning new techniques to journal when I don't know what to write. I learned to 'just write.'" 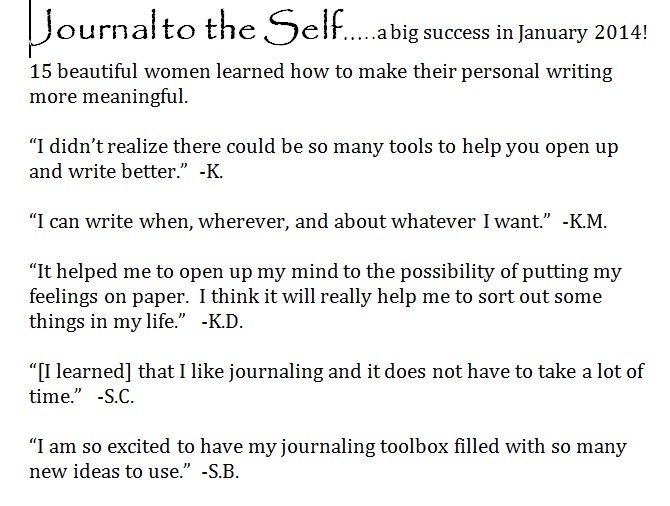 "I can use journaling in many ways. That I needed to be given permission to not follow any rules." "Journaling will help me stay grounded. I am more creative than I thought." "I can put things into perspective and release the emotions." Thanks NASW and DCFS for sponsoring and hosting Therapeutic Writing for Clinicians on February 1, 2013. We were lucky to get a glimpse of the Superbowl festivities as our conference room overlooked Champion Square. Participants, you were great. Thanks for the lively discussion and for fully engaging in the entire process. Keep writing! It's good for your health! on November 15, 2012. Thank you to all those who attended. It was a pleasure to work with you!